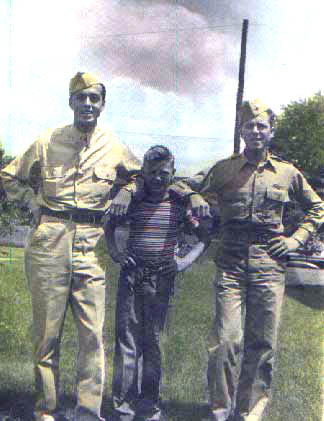 L to R: Martin "Mike" Maloney, brothers Gerard, and Dennis. Dennis was a B-24 Pilot in WWII. Gerard later spent 20 years in the Army, is a Vietnam vet. Mike Maloney's rugged Army jeep rolled to a stop in front of the gated mansion in the thick of the night. It was 1945 in Bad-Hamburg, Germany, and the armed security guards, guns drawn, were taking no chances. "I have a top-secret, urgent message for General Eisenhower," Sgt Maloney told the guards. Unimpressed, they didn't want to let him by. Maloney stepped out of the jeep and reminded the guards of protocol. Top-secret, urgent messages only go to the addressee-especially when they're for the general. The barricade swung open and Maloney walked toward the mansion, leaving the jeep with his armed passenger. "Off we go!" Maloney mused to himself, holding tightly to the large manila envelope. A second set of guards in front of the sweeping mansion, which had been commandeered for military use in wartime, was even less friendly. They pointed their guns in Maloney's face. "I have a top-secret, urgent message for General Eisenhower," he told the guards. They didn't care. "Give it to us and we'll deliver it to him," one said. "I can't do that," said the stoic Maloney. They called a colonel, who arrived many long minutes later. "Give it to me," said the colonel, "and that's an order." "I can't give it to you, sir," said the 23-year-old soldier. "I could get thrown in the stockade. This message can only be delivered to the person it's addressed to, and that's General Eisenhower." The colonel, after some choice words, acquiesced. A few minutes later, Maloney watched as Gen. Dwight D. Eisenhower, future President, walked down the sweeping stairway in a bathrobe and slippers, rubbing his eyes. Maloney saluted him and handed him the envelope. Eisenhower commended him for a job well done, noting that he'd been trained well and lived up to the reputation of excellence demanded of a U.S. Army soldier. "He invited me in for a cup of coffee," said Maloney, now 83, "but I told him 'no thank you' then saluted him and went on my way." Maloney doesn't know what the message said, but the war ended shortly thereafter, leaving Maloney with more than one story he'll never forget. The above essay and photos, "War Memory of Mike Maloney, were forwarded to us by Mike's brother Gerard and the Elkhart (IN) Truth newspaper. The article originally appeared in the Elkhart Truth on 11 November 2001. The material is re-printed here on World War II Stories -- In Their Own Words with the kind permission of Mr. Maloney. Our sincerest THANKS to Mr. Maloney for allowing us to share these excellent memories. Original Story submitted on 3 May 2005.